Goodness me. It's tax time again, 1/2 the year is over and it's nearly the end of our stay in Wadeye. I know I say it every month but boy, has July flown by. It's funny because we have no shops to visit, no shopping to do, have not turned the TV on, have no school sports to run to every 5 minutes, yet we don't have a minute to spare. Go figure!! This is the same for every month, but this one was a little different as we were off on holidays (like our whole existence isn't a holiday). The beginning of July had us heading off for a 2 week break as I mentioned in the June edition. This holiday we planned to stay fairly close to home as we didn't want to spend the whole time in the car. We will have enough of that in a few weeks time when we head off from Wadeye towards the centre. We got away at lunch time on the Thursday and again made it as far as the Mango Farm at Daly River. It is becoming a bit of a favourite of ours. Next morning we headed off to Litchfield NP. From the Daly there are two ways to get to Litchfield. The long or the short way. The long entails traveling north on the Stuart Highway then turning west. That trip is easily a couple of hundred kms. The short way is via the 'Reynolds 4x4 Track' which is only 44kms. We were desperate to do this track, more for the excitement than the shortness but it has been closed since the wet. I rang the Rangers a number of times and they thought it 'might' be open. Alas it was closed, but speaking to some people a few days later, that could have gone in our favor. The road did open a few days later and these people who tackled it also had a Patrol. At one of the river crossings they had water over their bonnet and at times up to their wipers. While that doesn't faze us, having the camper trailer behind us might have added another challenge to the adventure, not to mention the possibility of some wet clothes. We planned to meet some good friends of ours from Bundaberg, Trish and Graeme for this holiday. They have been away for the past 7 months traveling in their new ' flash as a rat' motorhome, and just happened to be around this neck of the woods. We planned to meet them at Florence Falls campground and luckily they got there before us and secured a site. This is a very busy time of the year with most sites being taken by lunch or just after. We had 5 nights there and had so much fun. We swam, walked, talked and laughed. 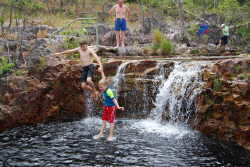 We visited Bouley Rock Hole, Wangi Falls, Blithe Homestead and a few other places. We had visited all these back in 2006 but are well worth a revisit. Trish and Graeme had visited this area recently as well, but at that stage were in a normal car and were unable to get to a number of places, as they require a 4x4. We all squeezed in our car and took off. During our time at Litchfield I also installed our new HF radio in the car which took most of one day. The HF will be such a great safety feature for our future adventures around Oz. We are able to contact every RFDS (Royal Flying Doctor Service) base around the country in an emergency as well as VKS 737 which is a HF radio organisation that we have now joined. They can be utilised for lots of reasons, including for emergencies. We now have a 6ft aerial hanging off the rear of the car, and will soon have a second one on the bull bar. We will look very important. Our new call sign is 'VKS737 Mobile 3311'. Anyway, back to Litchfield. FlorenceFalls is by far the best swimming hole/ waterfall and the camping ground is miles ahead of the others, be it just as busy as the rest. 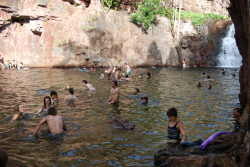 Bouley Rockhole is one of those masterpieces of mother nature with springwater feeding what seems to be an endless procession of clear deep swimming holes. While the water was somewhat cool on entering you soon became used to it and could actually swim for hours without being cold. Not bad for the middle of winter!! Just as we were about to leave Litchfield and head off to Darwin for a few days we received a call from Bryan and Jane from Merimbula, NSW. These are the people we met on our trip around the block in 2006 and the ones who have the caravan business in Eden, NSW where we did all the caravan modifications. Small world. They were in Darwin and heading off to the Kimberleys for a 3 week trip. We arranged to meet them the next day at 'Douglas Hot Springs', which was totally in the wrong direction for us, but who cares, we are on holidays and living in the NT where what ever happens, happens. Douglas Hot Springs is such a great place, and one we visited in 2006. It has a good campground and the hot thermal water is lovely. It comes out of the ground at 60C which is obviously too hot to get in, but meets the cold water and makes for a lovely warm bath. As with everywhere in the NT this is the 'busy' season and boy were there a lot of people. Plus the timing was such that it was NT 'bush holidays' as well! Chris said it reminded her of the movie 'Cocoon'- heaps of people lolling about in the water. It was such a hoot seeing the Hammonds again and we had a great night. They have got a real adventure ahead of them with plenty of exciting places to visit. The next day we made tracks for Darwin where we planned to spend to spend 4 nights. Visits to Darwin are always so frantic for us and they never seem to be leisurely. We hit the Mindil Markets on Thursday night, which was excellent, but almost exactly the same (and I mean exactly) as it was 2 years ago. Same stalls, same street entertainment and same food stalls. Then I dropped the car off to finally get a Cruise Control put in, which took all day. We had to leg it and catch buses for the day, which was actually heaps of fun. I am well aware the 'Cruise' should have been installed before we went on our last trip, but hey, better late than never. While it was ridiculously expensive ($800-00), it will be great on those long driving days. We also visited some friends who now live in Darwin, who we haven't seen for over 20 years. In fact it is partly due to Jenny and Mark that we are up here. They spent 2 years on Elco Island working as Remote Area Nurses, and that partly is what inspired us to do much the same. We had a great night at their lovely new apartment overlooking the city and the ocean. We certainly plan to see them more often than we have in the past. The remainder of our time was spent shopping, running around and doing more shopping. We also caught up with Chris's sister Anne, who is still in Darwin after her visit to us. Alex was excited as we finally bought him a new bike, and he is planning to give his old bike to one of the local kids, which is a lovely idea. He has chosen the successor and he will take it over to him soon. 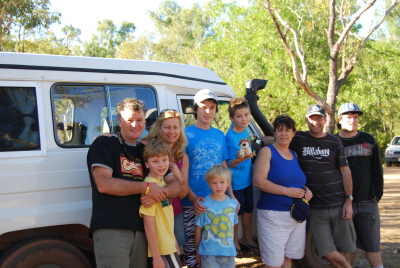 It was then off to Kakadu for nearly a week, again with Trish and Graeme. We again visited Fogg Dam which is outside the National Park, but an absolute must see. It was then off to Jabiru to grab a few things and then to Cooinda. I think this is the nicest end of the NP with plenty to see and do. Cooinda is a resort, come hotel, come caravan park. It has great facilities and if you go unpowered it is very cheap (in fact as cheap as camping in the NP, but with hot showers). It is also right next door to 'Yellow Waters' and the Yellow Waters cruise. We had done the sunset cruise in 2006 so decided we would do the sunrise trip this time. Why, I am not quite sure. It was freezing cold, very early (in fact dark) and to be honest, as beautiful as it was, we saw more wildlife in the later cruise. We were out every day visiting all sorts of places.Once again we all bundled in together and hit those 4x4 tracks. Every place we visited had long and sometimes difficult walks as part of the deal. As well as doing the cruise we saw Twin Falls, Jim Jim Falls, Barramundi Falls (Maguk) and Gunlom Falls. Some of the days were huge, but at the same time not to be missed. Trish and Graeme really appreciated the opportunity to see these places, and better still they really made our days even more enjoyable. For our last night before heading home we all headed back to Douglas Hot Springs for a damn good soaking and attempted to get rid of that ground in dirt. We traveled with these guys for nearly two weeks and had a ball. Trish had only one wish, and that was that at least once, we had eaten and washed up before dark. Well that didn't happen, not even close. We will try harder next time Trish. So then it was that beautiful 190kms of dirt back home. It was actually a little sad as it was to be our last trip home on that road. We were all chatting in the car, talking about our time out here, what we have done and what we will miss about the place. It was then that we all decided that at some stage during the next couple of years we would come back, only next time for a slightly shorter length of time. In some strange way it was a bit of a relief as we have all grown very attached to Wadeye and the people (the locals) that live here. I for one actually feel more of an attachment to this place than I do to Bundaberg. Don't ask me why. It was good to get back to work (my god, did I say that) and I think I was actually missed. Chris and the boys still had a week off (they get 4 weeks mid year break) so they tried to catch up on some school work. Unfortunately we also had to start packing and cleaning the house. We have collected so much gear since being here that we will have to send at least 3 packing boxes back to Bundaberg on transport. As much as we have seen since being here, there seems to be plenty that we still want to see, or see again. Pat, our resident Doctor and his wife Anne, the school Principal invited us out in their boat to the Moyle River. The Moyle is famous for barramundi and is a fair distance from home, so a larger boat is needed. I certainly would not tackle it in the tinnie we have been using all year. We had such a good day out but unfortunately our day was cut a little short due to the tides. While we saw some amazing things like millions of mullet schooling and jumping from the water to a huge saltwater crocodile pulling a car rim and tyre down the river in its mouth, the barramundi remained elusive. I am afraid to report we are still Barra Virgins as they call them up here. Luckily we have been invited out again next weekend when the tides will be much more in our favour, and hopefully the gods will be kinder so I can finally rid myself of my title. I will let you know next month how we got on, or you may even hear me yell, groan and moan if I get lucky. We again visited Fossil Heads that has been closed for some time since the death of the traditional owner. While we expected it would be closed for much, much longer we were lucky enough to be good friends with the new traditional owner. So while it is not officially open, as such, it is for us. We had a great day out there, in what is a very unique part of this country. Next weekend as well as continuing to pack and clean, and as well as going fishing we are also going to visit Redcliff again which is also officially closed still. Again it is not what you know but who. 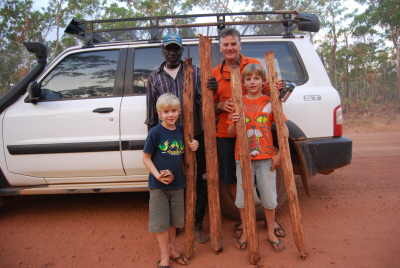 We had a great afternoon one day after work a few weeks back when we took Claver, our famous local didgeridoo maker out to cut down some diges. It was amazing watch him locate, cut down and basically prepare the diges, ready for a sand and the paint work. We are now keen to get out there and cut down a few for ourselves. Next month will be both sad and exciting as we move on, move South and move into the next adventure. It is possible that next month's update may be a little late as we will be in the middle of nowhere, and without I am sure phone reception. I will upload it as soon as I am able. Stay tuned. Newsflash- We just recieved a phone call today (31/7/08- Chris's Birthday) from NT Govt that we are now going to work at 'Kings Canyon Resort' for at least a month when we leave Wadeye instead of Docker River. Sounds tough, hey. After that it will most likely be Docker, but who knows.